Background Endometriosis is a chronic condition affecting women of reproductive age and is associated with multiple health burdens. Yet, findings regarding its ‘developmental origins’ are inconsistent. We aimed to investigate the associations of birth characteristics with endometriosis. We also explored potential mediation by adult social and reproductive factors. Methods This cohort study consisted of 3406 women born in Uppsala, Sweden, between 1933 and 1972. We used data from archived birth records and endometriosis diagnoses at ages 15–50 recorded in the national patient registers. Socioeconomic and reproductive characteristics were obtained from routine registers. HRs were estimated from Cox regression. Results During the follow-up, 111 women have been diagnosed with endometriosis, and most cases are external endometriosis (ie, outside the uterus, n=91). Lower standardised birth weight for gestational age was associated with increased rate of endometriosis (HR 1.35 per standard deviation decrease; 95% CI 1.08 to 1.67). This increased rate was also detected among women with fewer number of live births (HR 2.38; 95% CI 1.40 to 4.07 for one child vs ≥2 children; HR 6.09; 95% CI 3.88 to 9.57 for no child vs ≥2 children) and diagnosed infertility problem (HR 2.00; 95% CI 1.10 to 3.61) prior to endometriosis diagnosis. All the observed associations were stronger for external endometriosis. However, no evidence was found that number of births was the mediator of the inverse association between standardised birth weight and endometriosis. Conclusion This study supports the developmental origins theory and suggests that exposure to growth restriction during the fetal period is associated with increased risk of endometriosis during reproductive years. Endometriosis is a chronic inflammatory condition found among women of reproductive age and is associated with pain symptoms and subfertility.1 It is defined as the abnormal presence of endometrial tissue (eg, glands and stroma) outside the uterus, most commonly on the pelvic peritoneum and ovaries.2 3 Adenomyosis is also classified as endometriosis by the International Classification of Diseases (ICD) and is the presence of the ectopic mucosa appears within the uterus, usually in the myometrium.4 The reported prevalence of endometriosis varies between 2% and 5% in the general female population,2 5 with an estimated 0.1% annual incidence among reproductive-aged women.5 6 The true occurrence of endometriosis is unclear, due to variations in clinical presentations, diagnostic criteria and many asymptomatic cases.1 The aetiology is not well understood, and better knowledge about developmental mechanisms are needed. Using a population-based cohort study and data from Swedish national registers, we investigated the associations of birth characteristics with the incidence of endometriosis, and separately analysed external endometriosis and adenomyosis. We also explored potential mediation by adult social and reproductive factors. The study population is from the Uppsala Birth Cohort Multigenerational Study.20 For original cohort members resident in Uppsala, we identified their 4429 female offspring (ie, index women) born between 1933 and 1972 through the Multi-Generation Register (MGR). Among these, archived obstetric records were traced for 3476 (81%) women. We excluded those who were multiple births (n=54), died or emigrated before the start of follow-up (n=16). The final study population included 3406 singleton women. Table 1 presents the social and health characteristics of women in the study. The primary exposure variables were birth characteristics and were obtained from archived obstetric records. Gestational age was measured in completed weeks from the last menstrual period of the mother. Standardised birth weight (for gestational age) was created by standardising birth weight by gender and week of gestation using the total Swedish population of births (1973–1998) as a reference. Parental age at the birth was identified through the MGR. Family socioeconomic position (SEP) in childhood was based on father’s occupation and was obtained from Census 1960. If father’s occupation was not recorded, then mother’s occupation was used. SEP was categorised into high (higher and intermediate non-manual), intermediate (entrepreneurs and lower non-manual) and low (manual).21 Mother’s lifetime endometriosis diagnosis was identified using the patient registers described below. Women’s adult education in 2008 was obtained from the Longitudinal Integration Database for Health Insurance and Labour Market Studies (LISA) and categorised as elementary, shorter secondary, longer secondary and tertiary education. If the information was missing, we used the most recent year available from LISA (1985–2007) or the Censuses (1960, 1970 and 1990). We generated standardised income by standardising individual disposable income by age and gender in each calendar year, and then averaged them across all available calendar years when the woman was aged 25–65, and was obtained from Censuses 1970 and 1990 and from the LISA 1990–2008. Reproductive factors before diagnosis of the disease in question were number of liveborn children from the MGR (0, 1, 2 or more), and diagnosed infertility identified through the National Patient Registers (ICD-7 code 636, ICD-8 code 628, ICD-9 code 628 and ICD-10 code N97). Age at first and last childbirth was also recorded from the MGR and was examined in a subset of parous women. Cases were identified as the first recorded main or contributory diagnosis from the Swedish national inpatient and outpatient registers. The inpatient register covers public and private inpatient care in Sweden and was gradually built up from 1964.22 The Uppsala region, where most subjects resided during the follow-up, has a virtually complete coverage from 1968, while other parts of the country were included from the beginning of the 1970s, and all counties were included by 1987.23 Therefore, index women were followed from 1968 onwards. Previous validation study has estimated that the percentage of correct endometriosis diagnosis in the inpatient register was very high, with a positive predictive value of 97.8%.22 In addition to the inpatient care, the outpatient care was gradually included from 2001. Endometriosis defined as the abnormal presence of endometrial mucosa at any site was based on the specific ICD codes relevant for each calendar period: 625.3 (ICD-8, for the years 1968–1986), 617 (ICD-9, for the years 1987–1996) and N80 (ICD-10, from 1997 onwards). To assess whether the associations of interest varied by the presence of endometrial mucosa outside or within the uterus, we separately analysed two subtypes of endometriosis. External endometriosis (outside the uterus) included diagnostic codes: 625.30–625.32, 625.38 and 625.39 (ICD-8); 617.B-617.X (ICD-9); N80.1-N80.9 (ICD-10). Uterine adenomyosis included codes: 625.33 (ICD-8); 617.A (ICD-9) and N80.0 (ICD-10). Women were allowed to be classified as cases for more than one endometriosis subtype (eg, we did not censor woman from the follow-up for external endometriosis, if she was diagnosed with adenomyosis previously). We applied Cox proportional hazards regression to estimate the hazard ratios (HRs) with women’s age as the underlying timescale. Women were followed from age of 15 years or 1 January 1968, whichever was latest. Follow-up continued until the woman turned 50 years of age, or until 31 December 2008, death, emigration or the first diagnosis of the outcome in question, whichever was earliest. Tests for the proportional hazards assumption were performed by the Schoenfeld residuals method, and there was no strong evidence of violation by primary exposure variables for endometriosis (all p>0.04) or its subtypes (all p>0.13). Among all covariates, 0%–5% of data were missing and was imputed with the multiple imputation method (25 imputations). Other study covariates than the variable with missing, event indicators, and the Nelson-Aalen estimator for cumulative hazard were included in the imputation model.24 All Cox models were analysed from imputed data. Standardised birth weight and gestational age were used as continuous variables since there was no non-linearity evidence as confirmed by the multivariable regression splines.25 Robust standard errors (SEs) were used to account for potential correlations between women born from the same mother. All models were adjusted for women’s birth year, and standardised birth weight and gestational age were mutually adjusted. Further, earlier life confounding factors for sets of explanatory variables at different life periods (birth, perinatal and adult factors) were additionally added into the adjusted model. Due to the small number of cases, adenomyosis was only examined with adjustment for birth year. Mediation analysis was conducted to explore the indirect effect of the observed adult predictor: number of live births with respect to the association between standardised birth weight and the outcome of interest. The g-computation procedure (gformula in STATA) was applied to estimate the total, direct, and indirect effects based on individuals with complete data.26 SEs were obtained by bootstrapping. No statistical significant interaction between standardised birth weight and number of live births was detected (all p>0.07); thus, mediation models were fitted without the exposure–mediator interaction. All potential confounders for the exposure–outcome, exposure–mediator and mediator–outcome associations were adjusted in mediation models (see online supplementary figure 1 for the causal diagram). First, to quantify the impact of any potential unmeasured confounding on the main association between standardised birth weight and endometriosis, we performed the E-value analysis for the total effect proposed by VanderWeele and Ding.28 Second, the main analyses were repeated among women who can be followed from the age of 15 (n=1155). Third, we repeated the main analyses restricting to cases identified in inpatient register. Finally, we excluded women who had a hysterectomy before the start of the follow-up (n=1), identified through the Swedish Classification of Operations and Major Procedures (diagnostic codes: 7210, 7211, 7261, 7262, 7467, LCD00-04, LCC10, LCD10, LCD11, LEF13),29 and additional censored women at event of hysterectomy from the follow-up. We did not include this in the main analysis due to the common diagnostic delay and potential incomplete removal of endometrial tissue,3 30 31 which cannot guarantee a woman has zero risk of being diagnosed with endometriosis even after the removal of uterus. STATA version15 (StataCorp) was used to perform the analyses. Among 3406 women aged 15–50 years during the follow-up years 1968–2008, rate of endometriosis was 1.08 per 1000 woman-years. Incidence of endometriosis was higher around ages 25–30 and ages 40–50 (n=111; figure 1A). Similar trend was detected for external endometriosis (n=91; figure 1B). 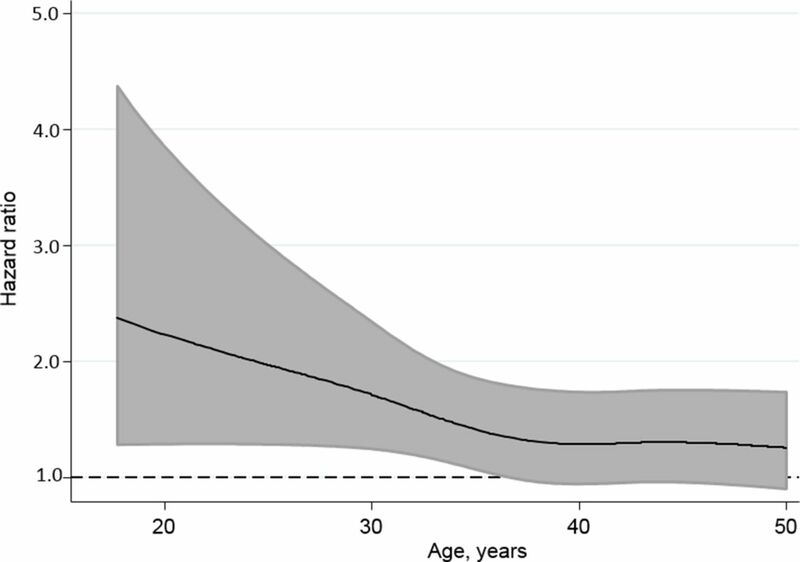 Incidence of adenomyosis increased gradually from age 35 years (n=24; figure 1C). Among all cases, 95% were from inpatient register (n=105), the rest were from outpatient register including hospital day-surgery (n=6, from 1997 onwards). Among 3406 Swedish women aged 15–50 years in 1968–2008, incidence rate of first diagnosis of endometriosis: (A) any type (n=111), (B) external endometriosis (n=91) and (C) uterine adenomyosis (n=24). The HRs for endometriosis and its subtypes by explanatory variables can be found in table 2. Standardised birth weight was inversely associated with the incidence of endometriosis. Specifically, rate of endometriosis was 35% higher per standard deviation decrease in standardised birth weight. The effect was attenuated when onset of the disease occurred during later stage of the reproductive life (figure 2). Standardised birth weight showed stronger and proportional association with external endometriosis, but not with adenomyosis. The results obtained from analyses that used four categories of birth weight: <3.0 kg, 3.0–3.4 kg, 3.5–3.9 kg and ≥4.0 kg with adjustment for gestational age and birth year were also consistent with a linear negative association between size at birth and risk of endometriosis (online supplementary table 1). None of our three outcomes were associated with women’s length of gestation. Adjusted HR between 75th and 25th percentiles of standardised birth weight on rate of endometriosis (any type) by age (n=3219). Note: Time-dependent adjusted HR was estimated from the flexible parametric survival model, with adjustment for gestational age and birth year. Grey area shows the 95% CI. The analysis restricted to women with complete data on birth characteristics. E-value calculations indicated that an unmeasured confounder associated with both the standardised birth weight and endometriosis (or external endometriosis) by a HR of 2.04 (or 2.24), respectively, could explain away the observed estimates; similarly, an unmeasured confounder associated with the main exposure and endometriosis (or external endometriosis) by a HR of 1.37 (or 1.51), respectively, could move the confidence interval to include the null, but weaker confounding could not. Neither mother’s age nor family SEP were associated with the incidence of either endometriosis or its subtypes. However, we found that women with older fathers had lower incidence of endometriosis. Endometriosis in mother was associated with increased incidence of endometriosis in the daughter. These observed associations were stronger when examined with external endometriosis and were not seen for adenomyosis. We found no associations of adult education or income with endometriosis. Number of live births prior to endometriosis diagnosis showed a negative dose–response association with endometriosis, similar but stronger association was found for external endometriosis. We did not detect this association for adenomyosis. Nevertheless, mediation analysis suggested that the inverse associations of standardised birth weight with endometriosis could not be explained by the number of births (online supplementary table 2). Prior infertility problem was strongly associated with increased incidence of external endometriosis, but not with adenomyosis. Women’s ages at first or last birth was neither associated with endometriosis nor adenomyosis in analyses on parous women (results not shown). In the sensitivity analyses restricted to women who can be followed from the age of 15, or to the cases identified in inpatient register, the results showed similar and somewhat stronger associations as compared with our main findings. Additional censoring for hysterectomy did not make any change on the main findings (results not shown). We found that women born with lower birth weight relative to gestational age were at increased risk of endometriosis, particularly external endometriosis. The incidence of endometriosis was also higher among women with fewer children and those with an infertility history prior to endometriosis diagnosis. However, the adverse effect of impaired growth in prenatal life did not appear to be mediated by number of live births of the women. Our findings suggest that endometriosis, and particularly external endometriosis, has a developmental origin, that is, lower birth weight for gestational age was associated with the risk of endometriosis. This finding is consistent with previous studies13 16 and gives support to the fetal origins theory regarding endometriosis. Slow fetal growth rate can be seen as an indicator of adverse intrauterine environment.32 Due to the developmental plasticity,33 conditions during the critical period of life may alter the development of tissues, hormone secretion or tissue hormone sensitivity in later life.11 Given that endometriosis is an oestrogen-dependent disease,34 it is possible that variation in ovarian steroid production during the reproductive period is the long-term result of the alterations in fetal endocrine status or subsequent hormonal milieu. Nevertheless, a previous cohort study suggested that, in contrast to its oestrogen-dependent pathophysiology, endometriosis is more prevalent among women who have lower body mass index in adolescence and young adulthood.35 Our study suggests that this finding could be explained by the fetal origins of endometriosis, in that slow fetal growth might partly confound the observed association between risk of endometriosis and lower body mass index. In addition, the inverse association between birth weight and endometriosis persisted after adjustment for the perinatal factors, particularly endometriosis in the mother. This is an indication that the association is independent from genetic factors. However, we may not have complete information on maternal endometriosis, since we only followed them from 1968, any cases before that would not be captured. Thus, future study with available information and more power should consider exploring residual familial confounding, potentially through sibling design. Nevertheless, the E-value analysis suggests that any such confounding has to be substantial to explain away the observed association. Intriguingly, we found that higher father’s age was associated with lower incidence of endometriosis in the adult female offspring. However, our data indicate that it is unlikely that the association could be explained by the size at birth of the offspring, the mechanisms underlying need further research. The relationships between socioeconomic factors and the risk of endometriosis are inconsistent across previous studies.36 37 Also in this study, we did not find any association with socioeconomic factors. However, this finding should be interpreted with caution since reverse causality cannot be completely ruled out. Although we only counted number of births prior to diagnosis of endometriosis, it is still possible that the woman could already have the disease prior to diagnosis. Additionally, since infertility is one of the consequences of endometriosis, the temporal sequence between these factors is difficult to determine. Importantly, while the observed associations indicate that women with fewer children and a history of infertility are in the high risk group of suffering endometriosis. In our data, there is no evidence suggesting that these reproductive factors are the mechanism underlying the developmental origins of endometriosis. We did not find any association between early life factors and adenomyosis. Adenomyosis is more common among women who have had multiple pregnancies.19 40 One possible explanation is that parous women are at increased risk of developing adenomyosis through more frequent exposure to uterine trauma. We could not assess this since the number of adenomyosis cases was small. To date, most epidemiological studies on this topic14 41–43 have failed to acknowledge the special condition of adenomyosis, and we suggest that future studies should separate adenomyosis from external endometriosis, since the potential predictors might be different for these two subtypes. The strengths of this study include the prospectively collected perinatal and adult characteristics, the separate investigations on external endometriosis and uterine adenomyosis and the use of inpatient data with high diagnostic accuracy. Through these, recall and misclassification biases can be minimised. However, our registered-based identification of the diseases might limit the generalisability of the study to less severe cases. Although some cases from outpatient register were included, these were few due to low coverage. We thus assume that there might be undiagnosed cases, since women with the disease can be asymptomatic. This is a common and unsolved issue with endometriosis research, because population-based screening for women to laparoscopy test is unrealistic.44 Another limitation is the lack of assessment of other factors that could explain the inverse association between growth rate in fetal life and risk of external endometriosis in adulthood, such as woman’s adult body mass index or hormone levels. Further research into the underlying mechanism, including maternal smoking during pregnancy will also help to understand the association. Among Swedish women of reproductive age, we found that slow fetal growth and adult factors, such as fewer liveborn children and prior infertility problems, were associated with higher risk of endometriosis, particularly external endometriosis. Our study supports the developmental origins hypothesis of endometriosis, but the specific mechanisms underlying the association require further investigation. The increased risk from adverse birth and adult factors seem to be limited to external endometriosis, and further research should distinguish the different types of endometriosis. Birth characteristics have been demonstrated to predict a wide range of adult chronic diseases (‘developmental origins’ theory). The developmental origins’ evidence with respect to endometriosis is inconsistent and debatable due to some limitations including potential misclassification of the disease, self-reported birth weight and unclear timing of onset or diagnosis of the disease. Among Swedish women of reproductive age, we found that slow fetal growth and adult factors, such as fewer liveborn children and prior infertility problems, were associated with higher risk of endometriosis, particularly external endometriosis. This study supports the developmental origins theory and suggests that exposure to growth restriction in fetal life is associated with the risk of endometriosis during reproductive years. The potential earlier life predictors are likely to be different for developing ectopic endometrial mucosa within the uterus as compared to outside the uterus. We thank Arijeta Makolli for data collection and data entry, Dr Anna Goodman (London School of Hygiene and Tropical Medicine & Stockholm University) for assistance in data management and advice on study design, Professor Bianca L De Stavola (University College London) and Dr Hannah Bower (Karolinska Institutet) for advice on statistical methods, as well as Dr Sujata Lalit Kumar (Karolinska University Hospital) for comments on an earlier version of this manuscript.
. Fetal and infant origins of adult disease. London: BMJ Books, 1992.
. Meddelanden i samordningsfrågor [Report on co-ordination issues]. Stockholm: Statistics Sweden, 1989;5.
. Kvalitet och innehåll i patientregistret. Utskrivningar från slutenvården 2007;1964:1997–2007.
. Recurrence of endometriosis after hysterectomy. Facts Views Vis Obgyn 2014;6:219–27.
. Mechanisms of disease endometriosis. New Engl J Med 2009;360:268–79. Contributors MG, PA and IK were involved in conception and design of the study. MG conducted the literature search and data analysis. MG, PA, GDM and IK interpreted the data and MG drafted the manuscript. All authors revised the manuscript critically for important intellectual content and gave final approval of the version to be published. Funding This study was supported by grants from the European Union’s Horizon 2020 research and innovation programme under grant agreement no 635316 (ATHLOS project), the Swedish Research Council (project no: 2013-5474), the Swedish Research Council for Health, Working Life and Welfare (project no: 2013-1850 and 2016-7312), the China Scholarship Council (no: 201600160078) (MG) and the Australian NHMRC Principal Research Fellowship (no: APP1121844) (GDM). Ethics approval This study was approved by the Regional Ethics Committee in Stockholm, Sweden (dnrs: 03-117, 04-944T, 2009/1115-32, 2009/1830-32 and 2014/2058-31/5).